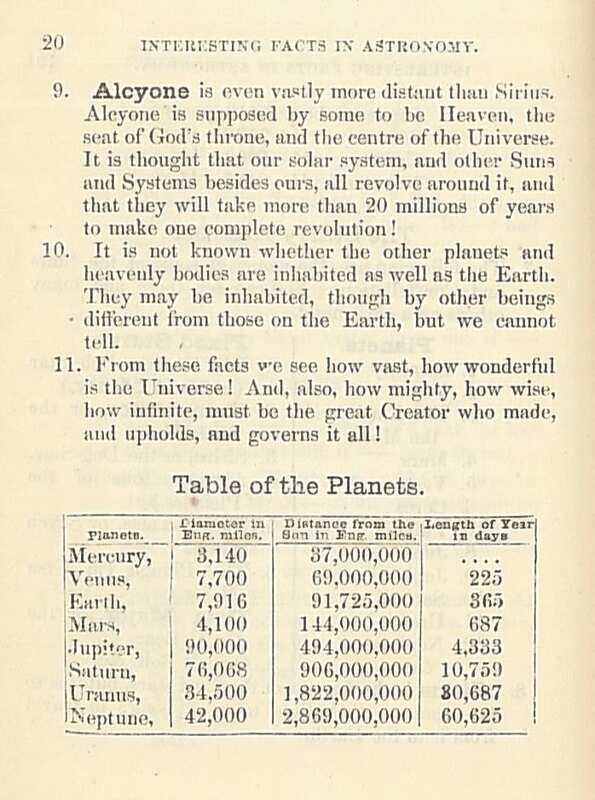 Questions on Astronomy – test yourself against Deaf pupils of the 19th century! Unfortunately we have no reports for the Halifax School, but it has a very interesting origin, which I found in Clifton F. Carbin’s comprehensive book, Deaf Heritage in Canada (1996, pages 125-7 in particular). The officially recognised founder was one William Gray (1806-1881), a native of Scone in Perthshire. Gray was, says Carbin, a pupil at the Edinburgh Institution, from the 26th of March, 1819, to 1824. He married Isabella Blyth (ca. 1819-93) in Edinburgh on the 11th of November, 1845. She was an Aberdonian who Carbin says was also deaf, and they had a daughter Isabella. He worked as a tailor. In 1851 they were living in Whitehouse Close, 276 Canongate, Edinburgh. In 1855 they emigrated to Halifax. It was there he chanced to meet another deaf Scot, George Tait (1828-1904). Tait, son of a Caithness farmer, had also been a pupil at the Edinburgh Institution, according to their records from 1842-9, but he claimed he was there from the age of 12 (ca. 1840) to 1844 when he went to sea (see Carbin). Trained as a carpenter, according to his later account, the captain of ship he was working on in Liverpool dock allowed him to masquerade as a sailor to get past the customs officer, and he went to sea, travelling to the West Indies, then Maine. He ended up joining his uncle who was also a carpenter, in Nova Scotia. When Tait arrived in Halifax in 1856, he was asked to tutor a deaf girl called Mary Ann Fletcher (1845-59). She urged him to start a school, and when he met Gray, who he saw signing, or finger-spelling, in the street, he suggested to Gray that he become a teacher. The school opened on the 4th of August, 1856. Tait later claimed his contribution had been ignored, and in 1907 a committee voted to favour the Gray claim as founder. The school was closed in 1861. Carbin says that there is little evidence as to the methods Gray used to teach, but he does not appear to have been terribly good at it. His time at the school ended in 1870 in disgrace, after he was charged with appearing in front of the pupils intoxicated, and threathening them with violence if they reported him. 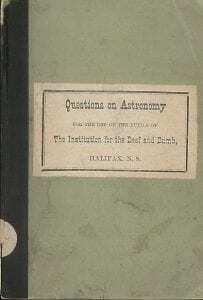 We have a small green booklet that was printed for the use of pupils in the school Gray – and Tait – started in Halifax, Nova Scotia, called Questions on Astronomy for the use of the Pupils of The Institution for the Deaf and Dumb. 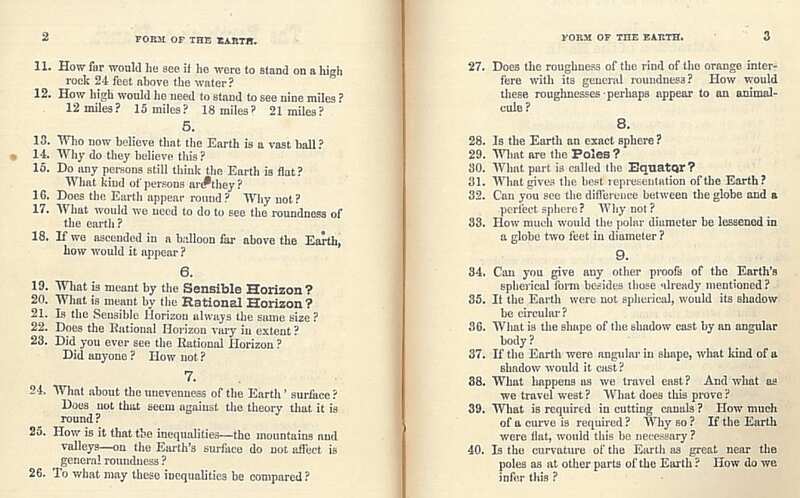 It was intended to test the pupils on their knowledge of the text book Calkin’s Geography, one of the books to be found here, so it was probably printed in the 1870s or 1880s. The knowledge that they were expected to acquire would test a modern geography student. Do you think that you could answer the questions? A link to the full document appears above. Who knew that Alcyone – in the Pleiades – was supposed to be heaven?